Posted on March 28, 2011	by J. 1) Biscuits made with lard taste different that biscuits made with butter. 2) Biscuits made with lard are #$%&^@ DELICIOUS omg why did this ever stop happening!???! Position rack in the center of the oven. Preheat the oven to 450 degrees. Set aside a large ungreased baking sheet. In a large bowl whisk together flour, baking powder, salt, and sugar. Hand mix the lard. Gently add in milk to make a soft dough. With floured hands knead dough gently 4 times in bowl. Turn biscuit dough onto lightly floured surface. Roll the dough to about 1/4″ to 1/2″ thick. Cut with a floured 2″ cutter. 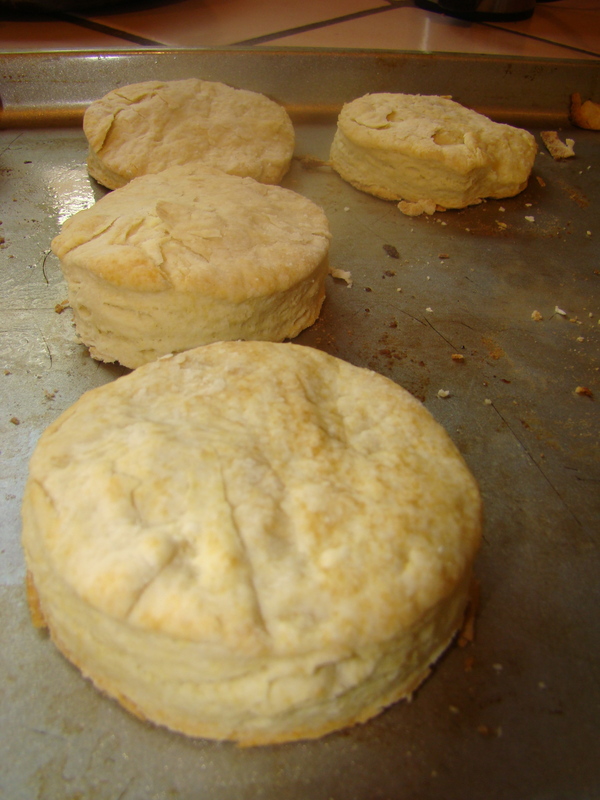 Place the cut-out biscuits about 1″ apart on ungreased baking sheet. Bake in oven until biscuits are golden brown, about 12 minutes. Serve these delicious lard biscuits piping hot. Originally from this site, but slightly tweaked. This entry was posted in Foodie Files and tagged things I make. Bookmark the permalink.